Recently Charli C from LA17 competed in her first submission grappling tournament for Brazilian Jiu Jitsu. In this tournament Charli was pushed up 2 weight categories and 2 age brackets competing in 8 fights (4 in Gi and 4 in No Gi). Not only did she win all 8, she received double gold in both events. 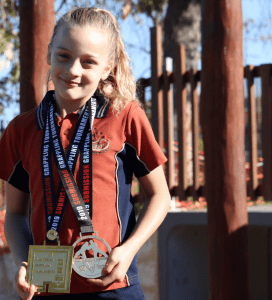 Charli was also ranked the number 1 Athlete Fighter for the whole tournament including the adults, finishing with the most submissions and points. Well done Charli!